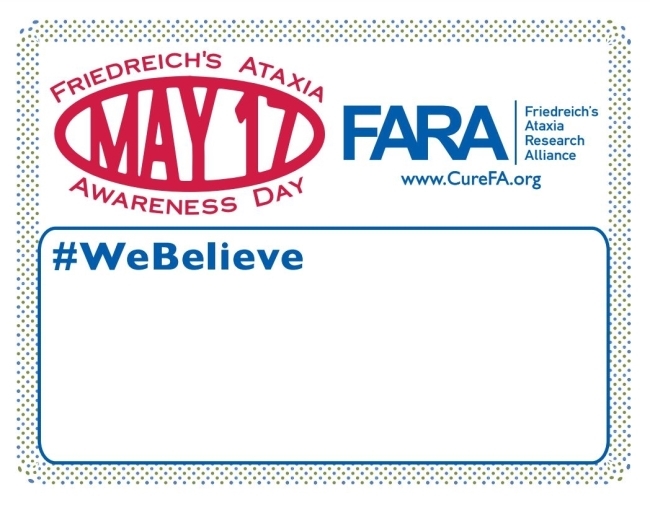 May 17 is FA Awareness Day, and the Friedreich's Ataxia Research Alliance is marking the day with its “We Believe” initiative, in which Facebook users can post photos to its page of people holding signs stating what they believe in. 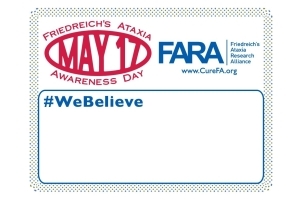 May 17 is FA Awareness Day, and the Friedreich’s Ataxia Research Alliance is marking the day with its “We Believe” initiative, in which Facebook users can post photos to its page of people holding signs stating what they believe in. Photos will be accepted through FA Awareness Day Saturday, May 17, and FARA will begin posting them Sunday, May 11. The nonprofit also encouraged users to post the photos on their own pages. What do you believe in? What drives you? What gets you up and out of bed in the morning? Is it money? Is it family? Is it hope? For families living with a loved one fighting Friedreich’s ataxia, it is the belief that one day there will be a treatment and a cure for this debilitating, life-shortening, degenerative neuro-muscular disorder. Meet Ryelee Burris. She is eight years old. She was diagnosed with FA when she was five years old. Ryelee sat in her wheelchair at the starting line of a cycling fundraiser to benefit the Friedreich’s Ataxia Research Alliance holding a sparkly sign that said, “Cure FA. We believe.” Ryelee believes in a cure. Like the thousands of people living with FA, she hopes and believes. But she needs more than that, she needs action.